Figure 37. Location of mining sites in the Tri-State Area (modified from Kansas Geological Survey 2001). The Oronogo-Duenweg Mining Belt site is located within Jasper County and entered the NPL in 1990, along with 10 other designated areas that cover over 270 square miles. Oronogo-Duenweg had over 10 million tons of surface mining and smelter waste (chat piles). At the time, these waste piles were uncovered and unstable, allowing leachate and runoff from the piles to enter groundwater and surface streams that supplied drinking water to about 500 homes. Human health impacts were assessed by ATSDR in a controlled “Lead and Cadmium Exposure Study” (Phillips et al. 1995). Both the actual blood-lead data from local children and a risk assessment concluded that health risks existed due to exposure to lead and cadmium in groundwater, soils, and locally grown produce. To manage remediation activities, USEPA assigned the following four OUs: OU-01, Mining and Milling Waste; OU-02, Smelter Waste Residential Yards; OU-03, Mine Waste Residential Yards; and OU-04, Ground Water. COCs included lead, zinc, cadmium, manganese, nickel, copper, and arsenic. 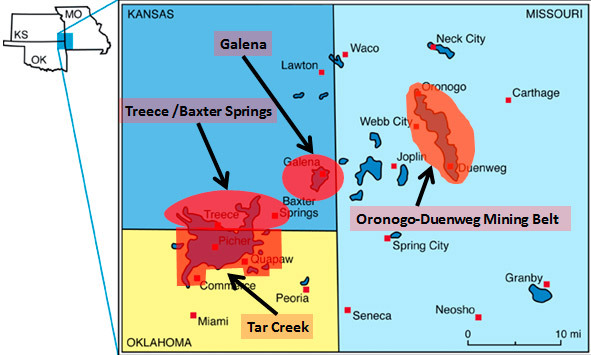 Galena, Treece, and Baxter Springs sites are all lead and zinc mining areas in Cherokee County, southeastern Kansas. Treece and Baxter Springs sites, two different mining locations, are themselves operable units. The Galena site, which has several operable units (alternate water supply, residential soils and groundwater/surface water) covers 25 square miles of areas covered by mine wastes, water-filled subsidence craters, and open mine shafts. Many of the shafts are direct conduits to the shallow groundwater aquifer that is the sole source of drinking water for approximately 1,050 residents outside of the Galena city limits. COCs include lead, zinc, and cadmium. The Tar Creek Superfund Site in Ottawa County, Oklahoma, is the Oklahoma portion of the former Tri-State Mining Area. The site covers approximately 40 square miles and includes the towns of Miami, North Miami, Quapaw, and Commerce. The towns of Picher and Cardin also were part of the site, but were dissolved as part of a residential relocation and buyout effort. Tar Creek is a stream that drains the most intensively mined areas of the site and is significantly contaminated with mining-influenced water. Mining here consisted of underground room and pillar mines about 200 feet below land surface. Processing of the lead and zinc sulfide ores occurred at mills located about every 40 acres and resulted in many large piles of chat covering the site. The frequency of mill sites at Tar Creek was the result of unique leasing requirements of the Native American–owned lands. Shallow and deep aquifers underlie the site. Groundwater in the shallow aquifer in the Boone formation has been contaminated with acid mine water, but it is unclear as to whether the contamination has reached as far as the deeper Rubidoux aquifer. Figure 38 shows the various sources of contamination and the pathways leading to media for exposure at this site. Figure 38. 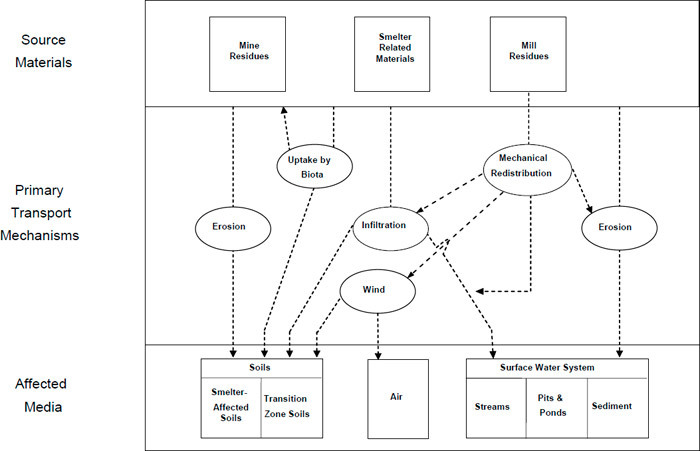 Tar Creek Superfund Site CSM diagram (USEPA 2008a). The Tri-State area includes widespread regional contamination of soil and surface water, as well as shallow groundwater. Forty million tons of chat remain at the Tar Creek site alone. Geological complexities include karst-like topography from mine voids with conduit flow and fractured breccia zones with secondary openings created by mining. Portions of the ground are subject to collapse or subsidence due to the presence of subsurface mine workings. Mining-influenced water containing dissolved heavy metals contributes to the transport of heavy metals into the water bodies, causing ecological impacts. Drinking water has been contaminated in many areas. Several residential properties at the site are eligible for relocation buyout. Numerous PRPs, along with the portions of the area for which no responsible party can be determined, make remediation responsibility and cost approvals for remedies or investigations legally complex. Stakeholders include local Native American tribes in addition to government and private landowners and users, making stakeholder involvement an essential, time consuming, and potentially expensive component of any remediation process. Most sites in the mining district have over ten years of characterization efforts available describe the nature and extent of contamination of the mining wastes for different USEPA operable units. Although initial actions at sites such as the Oronogo-Duengweg site included providing bottled water to residents, initial characterization efforts generally focused on the nature and extent of mining waste contamination, as well as the transport mechanisms for pathways that could result in exposure. As part of the smelter waste residential yards operable unit, all residential yards were divided into quadrants and sampled for lead. In this case, if the sample results exceeded 800 mg/kg in any quadrant, the first action item consisted on excavating and removing the first 12 inches of soil. USEPA initiated investigation activities at the Treece subsite in 1988. The parties potentially responsible for contamination of this area took over the study in early 1990. This investigation explored the nature and extent of soil and water pollution at the subsite and recommended the best strategies for final remediation. The study of the Baxter Springs Subsite was grouped with the Treece subsite. USEPA initiated an investigation at the Baxter Springs subsite in 1987. The parties potentially responsible for contamination of this area took over the study in conjunction with the Treece investigation in early 1990. This study also explored the nature and extent of soil and water pollution at the subsite and recommended the best strategies for final remediation. Residential yard studies and initial remediation efforts similar to those at the Oronogo-Duengweg site were conducted at the Treece and Baxter Springs subsites, where soil was excavated to a maximum depth of 12 inches or until lead and cadmium levels were less than 500 ppm and 75 ppm, respectively. At the Galena site in Cherokee County, remedial investigations included field, leachate, and metallurgical testing to understand the geochemical behavior of these wastes and to assist in estimating total waste volume. Residential yards were contaminated in Galena from a historical primary lead/zinc smelter (EaglePicher), in addition to mine wastes. USEPA investigated the nature and extent of contamination and completed characterization reports in 1996. Extensive lead and zinc mining began in the early 1900s and ended by 1970. With few exceptions, the crude ore produced at the site was mined using underground mining methods. For the mines to operate, groundwater from the Boone aquifer was continually pumped out of the mines. When the mines closed and pumping stopped, the mines began refilling with groundwater. The metal-bearing minerals, which had reacted with oxygen during mining, were more soluble than they had been prior to mining. This increased solubility created highly mineralized acid mine water when groundwater returned to the previously pumped areas. Contaminated groundwater at the site occurs within the Boone formation (also known as the Boone Aquifer). The Boone formation is composed primarily of limestone, dolomite, and chert, with lesser amounts of sandstone and shale. Lead and zinc ore were mined from various members of the Boone formation. Also of interest at the site is the Roubidoux aquifer. The Roubidoux aquifer is composed of cherty limestone with several sand sequences near its base. The Roubidoux aquifer lies beneath the Boone aquifer, and the two are separated by 410 to 520 feet of limestone and shale of the Chattanooga group, the Jefferson City dolomite, and the Cotter dolomite. These units act as an aquitard and restrict groundwater flow between the Boone and Roubidoux aquifers. The Roubidoux aquifer is a major source of drinking water for the area near the site. The cities of Picher, Quapaw, Cardin, Commerce, Miami (located south of the site), and several rural water districts obtain their water supplies from the Roubidoux aquifer. Tar Creek and its primary tributary Lytle Creek comprise the principal drainage system within the Picher Field mining area, which is the main mining area of the Tar Creek site. Tar Creek is characterized as a small ephemeral stream with standing pools. The headwaters of Tar Creek are in Cherokee County, Kansas (located north of Ottawa County on the Kansas-Oklahoma border). Tar Creek then flows southward through the Picher Field between the towns of Picher and Cardin, to the east of Commerce and Miami, and it then flows to its confluence with the Neosho River. Tar Creek and Lytle Creek drain approximately 53 square miles. CSMs vary slightly from site to site. In general, the primary sources of contamination are the residual metal sulfides in the abandoned mine workings, chat piles, and tailing impoundments as well as historical impacts from smelting operations. Upon atmospheric exposure, metal sulfides can become oxidized and mobilize as dissolved metal compounds. These mobilized compounds create mining-influenced water that can further leach metals from bedrock, allowing high concentrations of dissolved metals to migrate into groundwater or run off into surface waters. Mining activities were often conducted below the water table. Groundwater was continually pumped out of this shallow aquifer to enable mining activities to take place. When operations ceased however, pumping ceased and mine shafts refilled by natural recharge. Heavy metals including lead, cadmium, and zinc leached out of the oxidized mine waste and have contaminated shallow groundwater. At other sites, such as those in the Tar Creek Superfund site, mining-influenced water contaminating groundwater in karst-like topography has the potential to migrate to the deeper aquifers and contaminate drinking water. In addition to voids in the natural strata, poorly constructed (or failing) deep water wells and borings could serve as a conduit for contaminant transport to the deeper aquifer. RODs included the identification, closure, and proper abandonment of deep wells and ICs on further development. Finally, mine water can discharge to surface water. The Kansas Department of Health and Environment (KDHE) has determined that Tar Creek and streams within the Spring River watershed (Willow Creek and Spring Branch) are either partially or not at all supporting aquatic life due to metals loading. More specifically, mining-related zinc load contributions to the Spring River by Willow Creek and Spring Branch and to the Neosho River by Tar Creek and its tributaries are documented in the ROD at 24,000 pounds per year and 220,000 pounds per year, respectively. The mining tailings piles, locally known as chat, cover large areas of the ground surface. These waste piles are uncovered and unstable. Leachate and runoff from the piles enter groundwater and surface streams. Wind can blow contaminants from the chat piles onto neighboring properties; see Figure 39 for an example of weathered Tar Creek chat pile. Figure 39. Weathered Chat Piles at the Tar Creek Superfund Site (ODEQ 2008). Although wind and water have spread this contamination to human and ecological receptors, the Tri-State mining district has a long history of using tailings and chat for different purposes such as in asphalt; in cement used for footings, basements, sidewalks; and in driveways, landscaping, walking paths, and sandboxes. Residences have even been built on chat fields. After the 1991 initial investigations of the Oronogo-Duenweg Mining Belt site, USEPA issued a Unilateral Administrative Order to the PRPs to provide bottled water to residents and to conduct additional private water well sampling and provide bottled water where exceedances of action levels were found. In 1991, the Missouri Department of Health began a large-scale health study to evaluate the effects of mining waste on local residents’ health; in 1994, the results of the study found elevated lead levels in blood of local children. In 1996, USEPA issued a ROD for remediation of contaminated soil at residences in former smelting areas and mining waste impacted areas (OUs 2 and 3); this remediation took place from 1996 to 2002. A health education program was also established to educate residents about the health effects of mine waste (particularly lead). Remediation of soil was completed at 2,600 properties. In 1998, USEPA issued a ROD to address contaminated groundwater. This ROD called for implementation of alternate public water supply and point-of-use treatment to replace private wells contaminated by mining waste. The 1998 ROD was signed with a TI waiver for groundwater due to the extent of contamination and inordinate cost to remediate the groundwater. Both the 1996 and 1998 RODs called for ICs to set limits on new construction on contaminated property and prevent installation of groundwater wells in contaminated groundwater. Remediation of OU1 is currently underway. OU5 was established to address perennial streams that have been affected by the mine waste. OU5 will be addressed once remediation of OU1 has been completed. Numerous other actions have been taken at the site – hundreds of residential yards were cleaned up, HEPA vacuums were provided to residents to eliminate the interior dust exposure pathway, and the county established an ordinance which requires testing of soils for lead, cadmium, and zinc before residential development (including standards for construction and clean fill) (Figure 40). (Missouri Department of Natural Resources 2017). Following the completion of investigation activities in 1994, USEPA and the responsible parties entered into a Consent Decree in 1999. The Consent Decree required the responsible parties to complete remedial designs and remedial actions at the Baxter Springs and Treece subsites. 1986-1987: Investigation at Baxter Springs. USEPA installed water treatment units on 8 contaminated wells, completed a countywide survey of wells, added 2 water treatment units later replaced by an alternate water supply, and drilled new wells. 1995: Interim removal actions for soil at 62 properties including daycare centers. USEPA investigated using phosphorus to sequester metals instead of excavating. The investigation was completed in the summer of 1994 and a remedy was selected in 1997. Negotiations with the responsible parties were conducted in 1998 and 1999. The responsible parties agreed to perform the remediation in 1999 and formalized this commitment by entering into a Consent Decree with the USEPA. The Baxter Springs and Treece subsite remedial actions were grouped into a single ROD. Remedy implementation began in late 1999 and was completed in 2000. At Treece, approximately 150 residential properties were sampled and 41 properties were remediated. The remediation of the Baxter Springs subsite began in late 1999 and was completed in 2004. Over 440 residential properties were tested and 46 properties remediated. The Baxter Springs and Treece remedies also included the abandonment of wells. A Consent Decree addressing the nonresidential PRP portions of the Treece subsite was successfully negotiated in 2008. The Consent Decree has been lodged and is currently pending, but is expected to be entered and final in 2012, followed by the initiation of PRP-led remedial design activities for nonresidential mining wastes at the Treece subsite. Air monitoring activities resumed at the Treece subsite in 2009 and continued through 2011, when they were halted. Excavate, consolidate, and/or cap all surficial mine waste followed by disposal and capping. Use subaqueous mine waste disposal to the maximum extent practicable. Encourage source reduction via responsible chat sales before and during remedy implementation. Adopt ICs for future development specified in an earlier ROD. An ESD for voluntary residential relocations at the Treece subsite was released in 2010 by USEPA Region 6 for the Tar Creek Superfund site. Mine wastes in Oklahoma affect areas in Kansas, thus the decision document was released by USEPA Region 6 and covers the Treece subsite in USEPA Region 7. The Relocation Trust was formed by the governor of Kansas and supported by Kansas Department of Health and Environment to facilitate relocation from 2011 to 2014. Modified Alternative 8A (the selected alternative) estimated approximately $66 million as a cost-effective permanent solution to mine waste impacting the Baxter Springs and Treece subsites of the site. Modified Alternative 8A will achieve all RAOs, meet all ARARs, require no additional ARARs waivers, and may provide substantial future monetary gain or benefit by providing toxic tort relief. The remedy will also provide more suitable natural habitats. Modified Alternative 8A is especially cost effective compared to the benefits derived from reducing or eliminating future environmental or legal claims under other statutes or laws. In 2007, Congress provided USEPA with an exemption from the Uniform Relocation Assistance and Real Property Acquisition Policies Act of 1970, which enabled USEPA to offer relocation at much lower cost. The exemption applied first to Oklahoma residents in the Tar Creek subunit, then the act was extended to Treece, Kansas, residents in 2009. The ESD in 2010 primarily established a revised cost estimate and a framework for other policy decisions that would need to be made to relocate the residents of the area in both Oklahoma and Kansas. 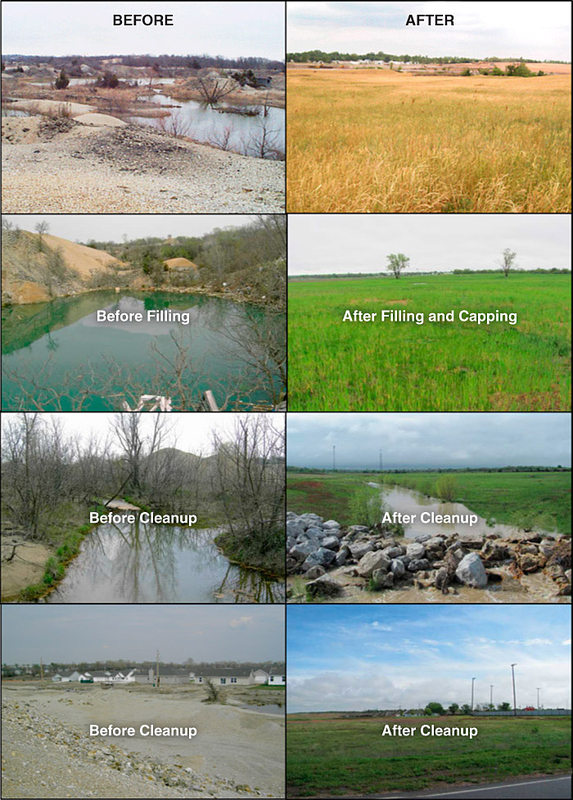 The selected remedial action for this site included the removal, consolidation, and on-site placement in mine pits, shafts, and subsidences of surface mine wastes; diversion and channelization of surface streams with recontouring and vegetation of land surface; and investigation of deep aquifer well quality followed by plugging all abandoned and inactive wells and rehabilitating active wells, if necessary. USEPA released the ROD for the remediation approach for metals-impacted residential yards in 1996. The remedy included excavation and disposal of contaminated soils, followed by placement of clean backfill and grass sod or seed. The approach also included evaluating the feasibility of using phosphate treatment methods in the future, in lieu of excavation. The total number of properties remediated in Galena, inclusive of removal work, is 702; over 1,500 properties were tested. Remove and treat surface mine wastes via milling and flotation to remove the surface source of the contaminants. Recontour and revegetate the land surface to control erosion and to reduce surface water infiltration to the mineralized zone. Channelize and divert stream channels to reduce metals loadings in the streams and to reduce surface water infiltration into the mineralized zone. Investigate deep aquifer wells and remediate as necessary to protect the Roubidoux aquifer. Remove and transport all mine waste rock and chat to a single containment unit. Remove all mine waste rock and chat and selectively place the material in available pits, shafts, and subsidences. Place waste rock below ground based on size. Characterize chat as to lead and zinc content and place below ground or use for surface cover based on metal content. Characterize and selectively place surface-deposited mine wastes (waste rock and chat) in open subsidences, pits, and shafts. Divert and rechannel certain surface drainages and recontour and vegetate the ground surface to the extent possible. Investigate and remediate, as necessary, wells penetrating the deep aquifer to protect against contamination from the shallow aquifer and mining-related activities. Component 1 of the selected remedy would essentially eliminate human exposure via ingestion to contaminated mine wastes and reduce long-term shallow groundwater and surface water metals loading. Component 2 of the selected remedy would minimize recharge to the shallow groundwater system, reduce infiltration through the cover material, promote proper surface drainage, and control erosion. Component 3 of the selected remedy would protect the deep aquifer against contamination from the shallow aquifer. The estimated present worth cost for the selected remedy was $8,295,215, which included an annual O&M cost of $14,963. USEPA began environmental investigations at the Tar Creek Site in 1982. The first ROD was issued in 1984 to address surface water degradation of Tar Creek by the discharge of acid mine water, and to address the threat of contamination of the Roubidoux aquifer. The ROD called for plugging of wells penetrating the Boone aquifer (where lead ore was mined) to the deeper Roubidoux aquifer to prevent mining-influenced water from contaminating the deeper aquifer. Groundwater monitoring is ongoing. The ROD also called for diversion of surface water to improve water quality of Tar Creek. After an RI/FS showed elevated concentrations of metals (cadmium, lead and zinc) in the mined areas of Ottawa County, the site was added to the NPL in 1983. USEPA and the state of Oklahoma then initiated several RIs and identified five Operable Units, or OUs, at the Tar Creek site. 1982: USEPA began environmental investigations at the Tar Creek site. 1984: ROD issued for surface water and groundwater. 1994: USEPA conducted a five-year review and found that children living in Ottawa County had elevated blood-lead levels. This finding resulted in USEPA evaluating lead contamination in soils surrounding residential properties, and finding elevated lead levels in soil. 1995: Remediation of residential soils was conducted. 1997: Second ROD was issued for OU2. 2007: Remediation should be completed by the end of 2007 (USEPA Superfund ESD, Tar Creek Superfund Site, OU2, August 2007). The ROD for OU4 (chat piles, other mine and mill waste, and smelter waste) was signed in February 2008 (during the fourth five-year review period). OU4 addresses the undeveloped rural and urban areas of the site where mine and mill residues and smelter wastes occur as a result of mining, milling, smelting, or related operations. This ROD includes relocation of residents, removal of chat piles (sale of useable chat, relocation or reinjection into mine workings of unusable chat). A recent pilot study examined mixing the chat with water to form a slurry, then injecting it back into the workings of the mine. This project has been ongoing for approximately four years. OU5 consists of sediment and surface water in Elm Creek and Tar Creek starting at the confluence of Tar Creek and Lytle Creek to the Neosho River down to the point where it flows into Grand Lake. Investigations related to OU5 are ongoing, and a remedy has not yet been selected. The diversion of surface water has not significantly improved the water quality of Tar Creek. Within the last few years, two biochemical reactors have been installed to remediate mining-influenced water surface runoff at the Tar Creek site. A biochemical reactor is an engineered remediation system, similar to a constructed wetland, in which mining-influenced water enters an engineered cell. Sulfate-reducing bacteria and associated microorganisms in this cell, as a result of their metabolic activity, raise pH and precipitate metals as sulfides. More information on biochemical reactors is available from the ITRC Biochemical Reactors for Mining-Influenced Water guidance (ITRC 2013a). The two biochemical reactors are located at the Beaver Creek Mine Discharge Area and Mayer Ranch/Commerce site. Excavate lead-contaminated surface soil in residential areas. Replace excavated soil with clean soil and remediation of the remediated areas. Dispose of excavated soil on site in dry mining waste areas remote from the residential areas or, in the event of inability to dispose of excavated materials on site, disposal off site in an approved landfill. Cover or replace mining waste in traffic areas located near residences. Restrict access to mining waste areas located near residences by use of physical barriers (for example, fences and warning signs). Implement county-wide ICs, including community protective measures, to supplement engineering remedial actions. Residents located in Picher, Cardin, and Hockerville will be voluntarily relocated following the procedures and priorities established by the Lead Impacted Communities Relocation Assistance Trust (LICRAT). Chat and chat bases from distal areas, including associated historical chat covered haul roads and nonoperating railroad grades, will be excavated to the underlying native soil, transported and released to an on-site chat processor or future processing location located in a previously contaminated area of the site, injected into mine workings, or disposed in an on-site repository. Transition zone soils (soils around and underneath source materials) will be addressed by excavation followed by natural soil rebuilding. Smelter wastes will be excavated and disposed of in an on-site repository. Smelter affected soils will be managed in the same manner as transition zone soils. Fine tailings will be injected into mine workings or covered in place. The covered fine tailings may be consolidated to reduce the footprint of the final cover. Source material in Tar, Lytle, Elm, or Beaver Creek or other site waterways will be addressed on a priority basis through either excavation, the installation of a flexible membrane liner, or both as determined by USEPA. As an interim measure, sheet piling, berms, constructed wetlands, or other engineering controls will be installed for near-stream source materials to help prevent contamination from migrating to surface water. An alternative water supply will be provided to any household where mining-related contaminants in water drawn from rural residential wells exceed 0.015 mg/L for lead for rural households. Rural households that are within the area that has been designated for relocation under the Lead Impacted Communities Relocation Assistance Trust (LICRAT) relocation program, but which do not elect to participate in the relocation program, would be included in the households eligible for an alternative water supply (estimated two residences). Rural residential yards that are found to have concentrations of soil lead that exceed 500 ppm will be excavated to a maximum depth of 12 inches, and the excavated area will be backfilled with clean soil, contoured to promote drainage, and revegetated. This action includes residential yards that are identified for relocation. These provisions apply to approximately 4 households, based on the RI sampling. If those eligible for relocation decide not to relocate, their yards will be remediated. On-site repositories will be constructed to accept site source materials for final disposal. On-site repositories will be closed when they reach capacity or at completion of the remedial action. Closure will be accomplished by covering the repository with a soil cover, contoured to promote drainage, and revegetated. The remedy will be reviewed, at a minimum, every five years because hazardous substances remain on site with concentrations that exceed concentration levels that allow for UU/UE. The remedy will be reviewed to ensure protection of human health and the environment. As part of the five-year review, USEPA will evaluate the progress of chat sales. Chat piles and bases remaining after 10 years will be evaluated for commercial viability. This determination will be made using input from the chat/land owners, appropriate tribal representatives, and the commercial operators. Unmarketable chat piles and bases will be excavated, transported and released to an on-site chat processor or future processing location in a previously contaminated area of the site, injected into mine workings, or disposed of in an on-site repository. Abandoned chat haul roads and nonoperating railroad grades that are contaminated will be managed the same as unmarketable chat piles and bases. That is, they will be excavated, transported to an on-site chat processor, and released to that processor, or disposed of in an on-site repository. ICs and O&M activities will be implemented, as determined by USEPA, at repositories and covered, fine tailings ponds. Environmental monitoring will be conducted, as determined by USEPA, to test for contamination in ambient and near source air, surface water, groundwater, and sediment during remediation activities. Per the ROD, in situ treatment of mine water and P&T of mine water were considered too expensive. Post-remediation blood lead studies have demonstrated a 43% reduction in elevated blood-lead levels of children at the site and multiyear ecological studies have demonstrated the benefits of the mine waste remediations. Health education, blood lead screening, physician/health care worker education/training, and dissemination of lead hazard/identification information has been prolific. A follow up lead exposure study showed that blood lead levels in the area had decreased after many of the actions had been completed (Missouri Department of Health 2002). Nearly 1,400 acres of mining-impacted land have been restored. Over 4,000,000 cubic yards of wastes have been remediated. Nearly 3,000 residential properties have been sampled. Nearly 800 residential properties have been remediated. Over 500 homes have been provided with a permanent source of clean drinking water. Chemical characterization of several thousand samples of water, wastes, and soil was performed. Significant 43% reduction of elevated blood lead levels of children was achieved. The use of mining wastes on 1,000 miles of roads throughout the county was ended. Several million dollars were collected or recovered from responsible parties. Several hundred air samples have been collected and analyzed in various areas of the site. Three five-year reviews have been conducted, in 2002, 2007, and 2012. As of 2002, the contaminated soil at almost all the resident properties (except for a few where access was denied) were cleaned up. A subsequent blood-lead study showed that child blood-lead levels were well below the established target, indicating that the residential property remediation had achieved the objectives. As of 2007, the alternate water supply has been constructed and bottled water is no longer needed. Remediation of the mining waste (OU 1) began in 2007 and is expected to continue through at least 2018. Remediation of perennial streams will be addressed once remediation of OU 1 is complete. Four five-year reviews have been conducted, in 1995, 2000, 2005, and 2010. There are three operable units within the Galena subsite; OU1 provides an alternate water supply to residents. Initially, bottled water and subsequent construction of an alternate water supply (two rural water wells constructed to approximately 1500 feet below ground surface) replaced contaminated water. OU5 is Galena Groundwater and Surface Water, and OU7 is Galena Residential Soils. The remedy for OU1 is in the O&M phase and is being overseen by the state of Kansas. The alternate water supply has been expanded to include 100 new hookups (500 total) since completion of the remedial action in 1994. Work at OU5 has been conducted by USEPA and PRPs and is in different phases. The USEPA fund-led remediation was completed in 1996 and the PRP work is ongoing. Approximately 2.1 million cubic yards of mining wastes have been addressed to date. The USEPA portion of the remedy included remediation of approximately 900 acres of nonresidential land surrounding Galena. Mining wastes were segregated and placed at the surface or used as fill material for open dry shafts. The PRP work involves remediation of former smelter buildings and associated grounds. The buildings have been decontaminated and are currently being reused. The work for the surrounding lands is currently under design. O&M activities for OU5 consist of maintenance of revegetated areas and engineered drainages (enhanced by rip rap and geotextile). O&M of several of these areas has been difficult. The difficulties include areas with steep slopes, highly acidic conditions, and poor soil conditions that make it difficult to maintain vegetation. The state of Kansas is considering several alternatives to address the difficulties. These include reducing the slope/grade and adding terraces, and addition of soils, nutrients, fertilizers, and refined seed mixtures. The remedy for OU7 was remediation of several residential properties with lead-impacted soil. A smelter in the town of Galena was responsible for a much larger residential lead problem than at Treece or Baxter Springs because of the wind dispersion of smelter emissions over a large area. More than 1,500 properties were sampled in the Galena area, and over 700 residential properties were remediated. Approximately 180,000 cubic yards of impacted residential soils were remediated. This work was funded by USEPA under a 1996 ROD and was completed by 2001. A follow-up study of blood-lead levels in children revealed a significant decrease in blood levels following remediation. ICs implemented at Galena OU7, as well as other Cherokee County subsites, include health education regarding all aspects of lead exposure, blood-lead testing, physician education on the awareness and symptoms of lead poisoning, in-home lead assessments performed by nurses from the county health department, provision of a high efficiency particulate vacuum upon request by county residents, and quarterly reporting of all aspects of the ICs program. Other ICs implemented at both Galena and Treece/Baxter include restrictions on the inappropriate use of chat mining wastes, LUCs in contaminated areas and locations where wastes are capped, building permits, testing requirements for development in mining-impacted areas, and restrictions on use of the upper contaminated aquifer as a source of drinking water. Three five-year reviews have been conducted, in 2000, 2005, and 2010. The Baxter Springs subsite has two components to the remedy: a residential remediation and a mine waste remediation. The residential remediation includes sampling and remediation, if necessary, of residential soils. The residential contamination resulted from the import of mining wastes for use as driveway construction, landscaping, fill material, and alley/road construction. Contaminated residential soils will be maintained in a fenced soil repository in Galena. The mine waste remediation includes removal of wastes from minor streams and drainages, draining and capping tailings impoundments, and capping and revegetation of chat piles. The mine waste remediation addresses mine waste accumulations that potentially affect surface water bodies. Mining wastes are being cleaned up by both PRPs and USEPA. A first phase of mine waste remediation was conducted by PRPs under a Consent Decree signed in 1999 and included residential and mine waste portions that were completed and are now in O&M. A second PRP remediation (pursuant to a 2008 Settlement Agreement and Consent Agreement between the PRP and the state of Kansas) is currently ongoing. For several hundred additional acres of land for which no viable PRPs exist, USEPA is funding the remediation and a ROD amendment has been approved. This work is in the design phase. The USEPA-led design and remediation work addresses both the Baxter Springs and Treece subsites. Approximately 1.5 million cubic yards of mining wastes have been remediated by USEPA and PRPs to date. The components of the remedy for the Treece subsite are similar to those of the Baxter Springs subsite. The remedy components consist of a residential portion and a mine waste remediation portion. Both USEPA and PRPs are funding portions of the remediation. Additionally, due to impacts to the community of Treece by the Tar Creek Superfund site, USEPA is implementing a residential buy-out for the community of Treece, Kansas similar to Oklahoma communities adjacent to Treece. The state of Kansas is overseeing the implementation of the buy-out program. Four five-year reviews have been conducted, in 1994, 2000, 200,5 and 2010. To date, the remedial approach for protecting groundwater in the Rubidoux aquifer (plugging wells) has successfully protected the aquifer from contamination from the Boone aquifer (in which the mining activities were conducted). The remedial approach for preventing discharge of groundwater to the surface from the Boone aquifer (by preventing recharge of the Boone aquifer by diking and diverting water) has not been effective. This portion of the remedy diverted water from two mine shafts that were thought to be the main points of recharge to the Boone aquifer. However, it is now believed that there are many other significant points of recharge to the Boone aquifer, rendering this approach ineffective. A new approach to improving surface water quality in the Tar Creek area is the construction of biochemical reactors, a type of treatment wetland, to treat the mining-influenced water after it reaches surface water. As of the 2010 five-year review, the pilot studies are still in progress. Complete the effectiveness of the well plugging program and perform field work to identify the 19 additional wells penetrating both the Boone and Roubidoux aquifers and determine whether these wells need to be plugged. Complete remedial activities for OU2, including cleaning up additional residential properties and assessment of chat remaining in in driveways and alleyways. Complete the evaluation of surface water and sediments in Tar Creek to verify that no unacceptable human health or environmental risks exist. Implement ICs to limit use of shallow groundwater, including the Boone aquifer, that has been contaminated by mining activities. In 2006 USGS performed a revised groundwater modeling project to simulate groundwater flow in the formations underlying the Tar Creek site (Figure 41). This model will help USEPA and others refine their remediation efforts so that the lower aquifers are not affected by various remediation scenarios. Figure 41. Revision of the CSM at Tar Creek site (USGS 2006). The use of advanced tools, as well as collecting information from remediation programs and other sources, will allow regulators to safely design chat impoundments and disposal methods. 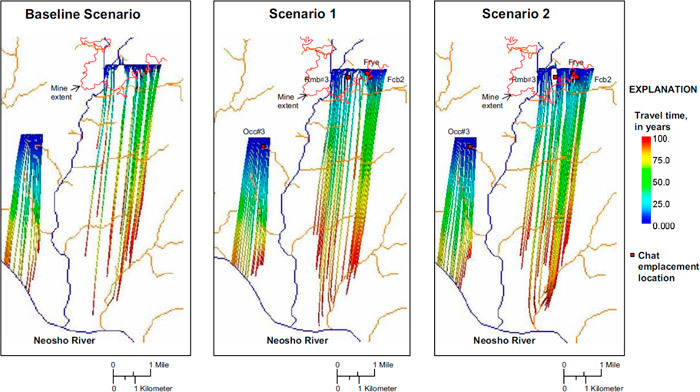 The scenarios below evaluate a 100-year estimated flow path for particles mobilized by infiltration that eventually will make their way to the nearby larger river drainage (Figure 42). Figure 42. Modeling scenario results for Tar Creek site (USGS 2006). In 2006 The U.S. Army Corps of Engineers (USACE) released a report concerning the threat of subsidence in Ottawa County. This report caused USEPA to reevaluate its plans for remediation of the site. There was a very active community action group at the Jasper county site, headed by the mayor pro-tem of Joplin. The group received a grant to hire a consultant to help them understand the information provided by the agencies on sampling and actions taken at the site. Community participation was essential, because many of the risk reduction strategies required the community to change their daily activities (gardening in raised beds, using HEPA vacuums indoors, and finding alternate sources of fill materials for sandboxes or other areas where exposure was possible). Community participation in the 1998 FS resulted in eliminating as many point-of-use treatment systems as possible and including extension of existing public water supply lines projects where practical and cost effective. Several public meetings and availability sessions have been conducted for the various remediations at the Cherokee County Superfund site, in addition to many discussions and meetings with citizens and local officials at several city council meetings held in the various communities at the site. The Cherokee County Health Department, County Commission, and County Engineer have been instrumental in supporting the USEPA’s environmental characterization and remediation activities. In general, the community and local officials have been supportive of all remediation actions conducted at the site. Establishing a local field office in 2007 facilitated the community involvement process. Extensive activities and communication among USEPA Region 7, USEPA Region 6, and Kansas Department of Health and Environment surrounded the buyout of Treece, Kansas. Numerous newspaper and magazine articles described the buyout process, the community’s response to the proposal, and community member perceptions about losing their identities and interaction with their neighbors. USEPA also continues to maintain a customer service toll-free phone number for its office personnel, making contact easier for the affected communities. USEPA Region VII encouraged public review and comment on the preferred remedial alternative by providing the public with the proposed plan and supporting documents included in the Administrative Record file. To provide the community with an opportunity to submit written or oral comments, USEPA extended the public comment period due to public interest. A public meeting was held to present the proposed plan, accept written and oral comments, and to answer questions concerning the preferred alternative. At this meeting, representatives from USEPA and the Kansas Department of Health and Environment answered questions about the subsites and the remedial alternatives under consideration. Responses to the questions and comments received during the public comment period are included in the Responsiveness Summary, which is provided as Attachment 1 to the ROD. The decision for these two subsites is based on the information contained in the Administrative Record file which is located at the earlier referenced repositories. The public was encouraged to participate in the Proposed Plan and ROD Amendment process at OU-3 and OU-4. The Proposed Plan highlighted key information from the RI and FS Reports, FS Addendum Report, ROD dated August 1997, final Remedial Action report for 1 the Baxter Springs subsite, final residential remedial action report for the Treece subsite, Five-Year Review Reports, and Administrative Record. Additionally, the public historically has been made aware of the environmental issues in the county through the many public meetings, public availability sessions, newspaper articles, television coverage, radio broadcasts, and press releases that have occurred at the site for the many environmental remediations conducted to date. To provide the community with an opportunity to submit written or oral comments on the OU-3 and OU-4 Proposed Plan, USEPA established a 30-day public comment period from July 24 to August 22, 2006. A public meeting was held at the Baxter Springs Community Center, Baxter Springs, Kansas, to present the Proposed Plan, accept written and oral comments, and answer any questions concerning the proposed remediation remedy. Over 60 people attended the public meeting and the event was covered by a local newspaper and television affiliates. A summary of the verbal questions received at the public meeting, inclusive of responses, was provided in a Responsiveness Summary. The Responsiveness Summary also contained a summary of written correspondence received during the public comment period, as well as written responses to that input. The Proposed Plan and supporting AR file were made available for public review during normal business hours at the Johnston Public Library in Baxter Springs, Kansas, and at the Region 7 office in Kansas City, Kansas. Additional AR files supporting the USEPA’s historical remediations at the Badger, Waco, Lawton, and Crestline subsites and Galena subsite are also available at the Region 7 office and at the Columbus Public Library in Columbus, Kansas, and the Galena Public Library, respectively. These additional ARs are incorporated into the OU-3 and OU-4 AR by reference. Moreover, the OU-3 and OU-4 AR has been updated with additional information to support this ROD Amendment. Remediation reduced the health risks from contamination for over 4,500 people in the Galena area, and improved the appearance of the local countryside. City officials are delighted with the improvements and have developed a tax incentives program to help attract new light industry. Community support for site remediation is strong. Preliminary results from the Kansas Biological Survey’s study of the site show improvement in environmental health. Collaboration with the state of Kansas and the KDHE was a key factor in USEPA’s successful implementation of a remedy to mitigate the contamination. The assistance of federal partners was instrumental in the design and execution of the remediation, and analysis of the health and environmental threats. The Agency for Toxic Substances and Disease Registry assessed the health effects of the contamination, and the U.S. Bureau of Mines helped the other agencies locate and plan remediation of the mine shafts, pits, and unstable areas. At the Tar Creek site, USEPA, in coordination with the Oklahoma Department of Environmental Quality (ODEQ) and the Quapaw Tribe, has kept the community, public, governmental entities, citizen advisory groups, and interested parties informed of Superfund remedial actions, and involved these groups in planning. USEPA used various methods for informing communities about on-site activities at Superfund sites and for seeking public participation in the NCP process. One routine activity USEPA uses is the development of site fact sheets and newspaper notices. Informational fact sheets at Superfund sites are routinely mailed to individuals on the site mailing list, which includes community members located within approximately one mile of the site, elected officials, and other interested parties who have requested information or who have attended public meetings. At the site, USEPA met with community members and performed various outreach activities in response to the site-specific needs of the community. This activity included responding to citizens, neighborhood associations, and other community organizations through informal discussions, community open houses, and public meetings. Multiple five-year reviews have been performed at the Tar Creek Site. The most recent Five-Year Review Report (ODEQ 2015) is available online and includes USEPA interviews with local citizens.